I’ve been flying with Flyskyhy for 2.5 years now and love it, especially when running on the iPhone 6 with its barometric sensor, but when I heard about a new Indiegogo funded “lag-free” Bluetooth GPS/vario called XC-Tracer, which works with Flyskyhy, I was keen to give it a go, particularly as some big names are flying with it already! So I duly got in touch with the designer, Swiss pilot Koni Schafroth, and asked if he would send me a unit to review, hoping that it would arrive in time for the British Open in Saint-André-les-Alps. Koni Schafroth is a Swiss paraglider pilot and designer who’s been flying for 25 years. He’s currently working on a project for the European Space Agency, whilst also consulting for the Swiss watch industry, and he somehow finds time to work for Gin Gliders too, where he came up with Gin’s Equalized Pressure Technology (EPT). If anyone’s qualified to shake up vario technology, it has to be him! The Swiss-made unit arrived about a week after I ordered it and all I had to do before I could fly with it was attach the provided sticky-back velcro and charge it up fully. Of course I also installed the latest firmware and took a look at the config settings file on the provided micro-SD card, but it was pretty much ready to go. (One thing you might want to change straight away is the sinkThreshold – it was set to -5.0 on my device). There’s not much to be said about the external appearance of the device – it’s got a solid case and all fits together nicely. The only control is the red button which turns the device on and off. Two LEDs display the charging status (red = charging, green = charged), whilst a yellow LED displays the GPS status (or USB Mass Storage Device status when connected to your PC). Battery status is indicated by a series of up to five beeps just after the unit is turned on: 5 >= 95%, 4 >= 75%, 3 >= 55%, 2 >= 35%, 1 >= 15%. All units are put through an exhaustive battery test before shipping and any that fail to run for 15 hours in a simulated flight (in indoor use the GPS uses 5mA more current as it is constantly searching for satellites) have their battery replaced with a new one before going through the test again. I got the feeling that the vario settings have a slight effect on battery life (eg. setting your sinkThreshold to -1m/s rather than -3m/s say will mean the device is beeping more and thus will consume more power, though I don’t have any hard data to confirm this, and in any case, there was still plenty of battery left after some of the longer tasks at Saint-André. Just how responsive is it? You might think that if it’s as sensitive as this then it’ll be too talkative in flight, but this isn’t the case at all – it’s lovely to fly with. For the first time I have a vario which beeps as soon as I hit lift, rather than a second afterwards, and perhaps more importantly, it stops beeping the moment you leave the lift. I’ve flown with it for 21 hours now, with the majority in nice strong Saint-André-les-Alps conditions during the British Open at the end of August, and it certainly helped in finding the core. 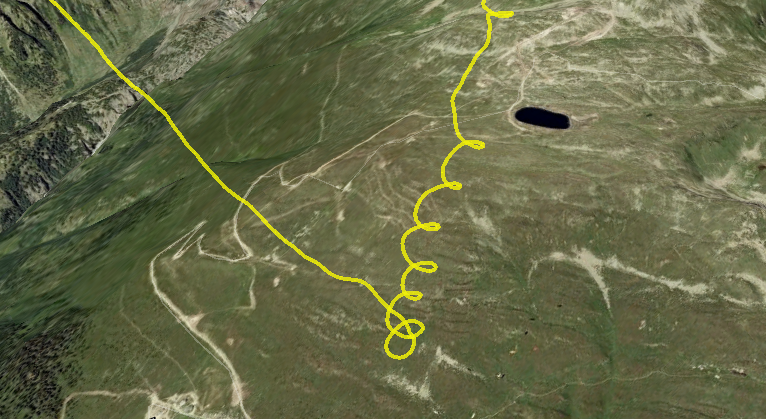 I also found it useful on glide by helping you to find those lifty lines, and it signals you to tweak the speedbar earlier than conventional varios allow. I also spent about half an hour flying in very weak conditions in the UK and I’m convinced it allowed me to stay up longer than I would have done otherwise, although I admit that is rather a subjective conclusion to draw! The question you’re probably asking is how does it achieve this remarkable sensitivity? By using a 9 Degrees of Freedom Inertial Measurement Unit (3 axis gyro, 3 axis accelerometer, 3 axis magnetometer) in addition to the usual highly sensitive pressure sensor… Clever stuff indeed! -10 to -2 m/s: typical vario tone here, impossible to ignore – get out of this sink fast! 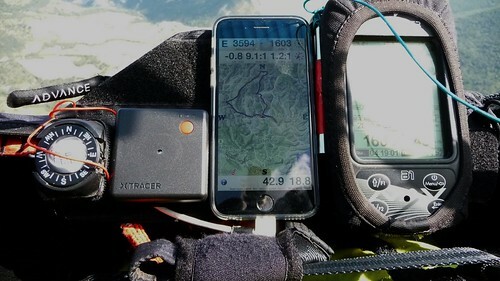 Because it has a built-in GPS, the XC Tracer can record your flight either as a signed IGC file at 1Hz, or else as a 5Hz Google Earth kml file, which are saved onto the supplied micro-SD card. Have you ever seen a track as smooth as this before? I’ve flown over 20 hours with the XC Tracer and I love its responsiveness – hearing the beep at the same time as you feel the pull from the wing is really great, and conversely, knowing immediately when you’ve left the lift is equally important. I think it really comes into its own in weaker conditions, and now that I’ve bought the unit I can’t wait to try it on a tricky UK XC day. Apart from the “Flymaster growl”, I haven’t missed my B1 Nav’s vario at all, and I have no plans to turn the audio back on again. In fact, I might just try leaving the Flymaster turned off altogether! As to whether I can get rid of my Flymaster just yet, if I only flew XC and not competitions, then yes, you could do, though personally I would be hesitant to do so just yet, primarily because of the Flymaster’s thermal position indicator which definitely does help you find the thermal again should you lose it. I know René has a thermalling assistant screen on the drawing board, so hopefully this feature will be along soon. If you’re a comp pilot then once René adds route optimisation (which he is working on) and a speed to start instrument, then there would be absolutely no need to spend £400+ on a comp capable GPS/vario. Welcome to the brave new world! With Christmas just around the corner, perhaps now’s the time to start dropping hints to your loved one to head over to xctracer.com 🙂 (NB. At current exchange rates the price of 345 Swiss Francs equates to approx £230). Edit 15/06/2016 I am now the UK importer for XC Tracer and the new solar powered XC Tracer Mini – please see my Facebook page for more info and to order. ~ by Tim Pentreath on September 15, 2015. Thanks for excellent review Tim. Amazing how they’ve come on in recent years, I’m playing with a Kobo, but this looks really great. I seem to remember that my Solario (which I actually use mostly for leisure flying (all I do) as used by one Bruce Goldsmith, I think I’m correct in saying) had some DIP switches to adjust thresholds – one of which is “sensitivity” so latency might be adjustable and not quite as bad as your video test – but I could easily be remembering wrongly (it’s in Spain so can’t check). BTW just for comparison my ancient tank like “Rolls Royce” Ball 655 still works and sits in pride of place on a shelf and Al Davies has a pith-ball vario in his collection! Yes, I did actually check the switch on the back of my Solario and it was set to the most sensitive setting (0.1m/s IIRC). Actually it’s not so much a sensitivity setting, just the threshold. If an immediate response is a good idea, why do normal varios have a damper setting? I see in this article https://flyaszent.wordpress.com/flymaster-b1-nav-settings/ that you set yours to 5, which means that you like a bit of damping. The damper setting makes it less twitchy by smoothing the response but a consequence of this must be to add a further small delay. If a vario is lag free and not too twitchy then that has to be good! Thanks for the review. Could you tell me which brand your compass is or where you bought it? Thanks! Hi, I’ve had that compass for 15+ years and actually bought it off a paragliding dealer who’s now moved to Montenegro. Sorry not to be able to help more. Thanks for making your XC Tracer acoustic profile available, excited to give it a try. I enjoy watching your videos, thanks for making them. All the best from Cape Town.